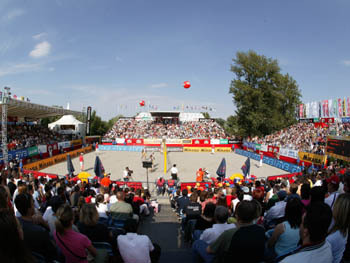 Zagreb stages SWATCH-FIVB World Tour men�s event for the fourth-straight season as the 2007 finale pitted two teams that rebounded from an opening setback in the double-elimination VIP Open to win seven-straight matches to reach the gold medal match. Kristian Kais and Rivo Vesik captured Estonia�s first-ever SWATCH gold medal by defeating Patrick Heuscher and Sascha Heyer of Switzerland 21-19, 17-21, 17-15 in the 64-minute finale. Brazilians captured the first two Zagreb titles as reigning Olympic champions Emanuel Rego and Ricardo Santos defeated the United States' Phil Dalhausser and Todd Rogers for the 2006 gold medal. Two weeks prior to winning the 2005 SWATCH-FIVB World Championships in Berlin, Marcio Araujo and Fabio Magalhaes won their first SWATCH-FIVB World Tour gold medal together by defeating Markus Dieckmann and Jonas Reckermann of Germany in the inaugural VIP Open final. The best finishes by Croatian teams in Zagreb have been 17ths by Toni Ivkovic/Pero Krizanovic and Kresimir Peric/Tomislav Steinocher in 2005 and 2006, respectively. Pictured to the right is Vesik (left) and Kais. Pictured below right is Heyer (left) and Heuscher. When the Croatian people achieved their independence in 1991, Zagreb became a capital - a political and administrative centre for the Republic of Croatia. Located on the intersection of important routes between the Adriatic coast and Central Europe, Zagreb is the hub of the business, academic, cultural, artistic and sporting worlds in Croatia. Many famed scientists, artists and athletes come from the city, or work in it. Zagreb offers its visitors the Baroque atmosphere of the Upper Town, picturesque open-air markets, diverse shopping facili�ties, an abundant selection of crafts and a choice vernacular cuisine. Zagreb is a city of green parks and walks, with many places to visit in the beautiful surroundings. The city will enter into the third millennium with a population of one million. In spite of the rapid development of the economy and transportation, it has retained its charm, and a relaxed feeling that makes it a perfect place to visit and discover.